MFHA developed Cultural Intelligence products and services that can enhance your value proposition and execution strategies. 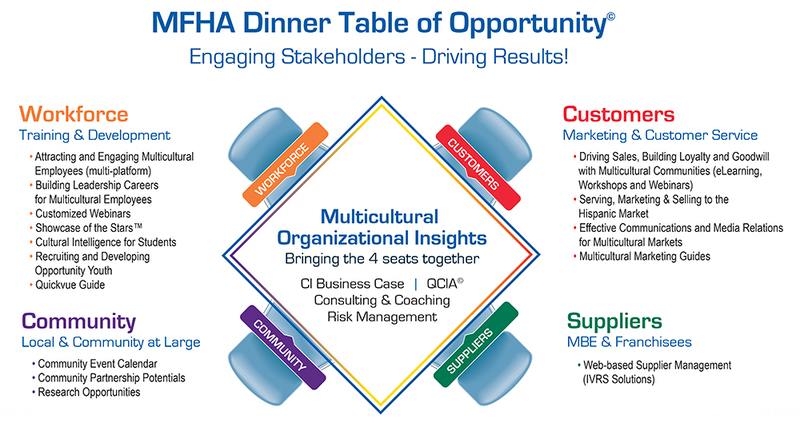 MFHA is prepared to help you develop a sustainable multicultural framework that will maximize your return on investment, build brand value, and increase your profits. Data and relevant factoids are used to illustrate where and how companies will benefit financially (reduced cost and increased sales) by employing multicultural strategies. Strategies and tactics that help reach different racial and ethnic groups are presented in a way that can augment existing recruiting initiatives. A multicultural community engagement blueprint illustrates how companies can create a sustainable community outreach effort that will attract customers and potential employees to the brand. Research from Harvard, The University of Chicago and others are used to illustrate how companies overlook talent due to unconscious bias. Practical solutions are offered to overcome these unconscious biases. Single or multiple cultural groups are explored to allow participants to see how different cultures experience the world and what managers can do to better engage and coach diverse talent. 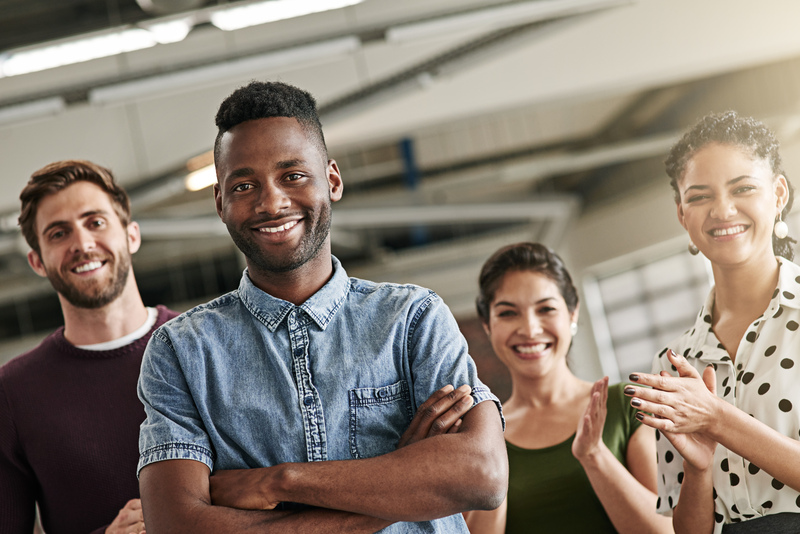 A culturally responsive model for developing millennial and multicultural talent. Developed at Morehouse College, participants learn strategies to develop into great leaders. A live, interactive career exploration event that promotes careers in the food and hospitality industry nationwide. It is designed to give companies a captive audience of talented multicultural high school and college students to share their diversity story, enhance employment branding, provide public speaking and exposure for employees, attract talent and give back to the community. Link to our website and post open positions. Also, post positions by request to MFHA’s LinkedIn group page. Opportunities also available for posting for non-members at a special rate. is a live interactive in-person workshop that takes participants through a series of real-world scenarios and “straight talk” dialog designed to challenge them to think and act inclusively about their interactions with various cultural groups in order to engage and become a more effective communicator. The primary audience is students of color and others who want to learn how to increase their cultural IQ. MFHA’s QCIA© is a self-administered questionnaire that enables a cross-sectional look at current Inclusion, Diversity and Cultural Intelligence programs and initiatives. Answers provide a quick snapshot of how your organization compares to the most culturally responsive companies. Once completed, MFHA provides the opportunity to have results reviewed by an experienced MFHA Consultant. A report is then provided with additional guidance on the next steps for organizational Cultural Intelligence. The Cultural Values Profile is a research-based inventory that helps individuals understand their personal orientation on ten cultural value dimensions. Developed by Dr. David Livermore, an internationally respected author and researcher in the field of Cultural Intelligence, the assessments are an excellent tool to build cohesiveness with multicultural teams. MFHA staff consultants are available to provide individual career coaching for Multicultural high potential talent. Executive level coaching on Multicultural issues is also available. MFHA has always advocated for minority and women business development opportunities in our industry. 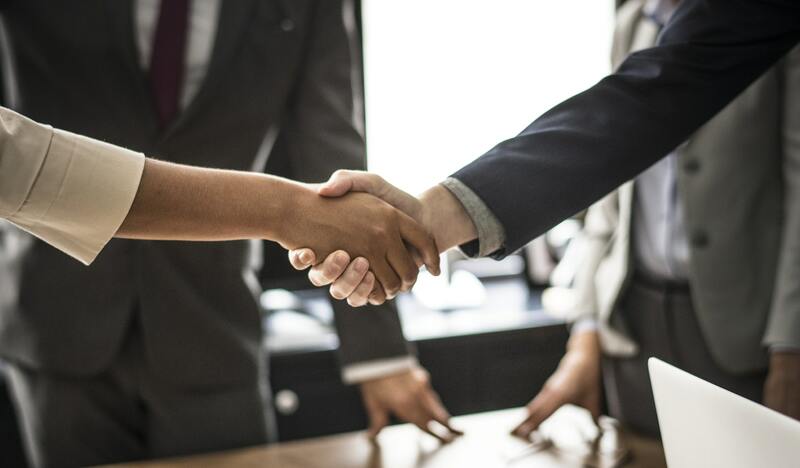 Best practices from across multiple industry segments are available to MFHA member companies who have an interest in developing and growing their minority supply chain or franchisee base. Since 1998 MFHA has conducted national and regional conferences that address the most critical Multicultural issues facing our industry. Workshops can be hosted by individual companies or at local meeting venues to deliver specific content. More information forthcoming regarding 2017 events. In today’s diverse and rapidly changing world, conflict across cultural groups can and will occur. MFHA and its consultants can provide coaching, insight, and connections to help minimize risk to the brand. The MFHA QuickVue Guide is designed to close the communication gap between restaurant managers and staff. It is a pocket-sized guide that allows individuals to instantly and effectively ‘get their point across’ in Spanish. Gleaned from industry input, the MFHA QuickVue Guide includes complete phrases and requests in such categories as food preparation, cleaning up, safety and hygiene. It also includes the pronunciation for those words and phrases included, allowing even those who have never spoken Spanish to easily be understood.